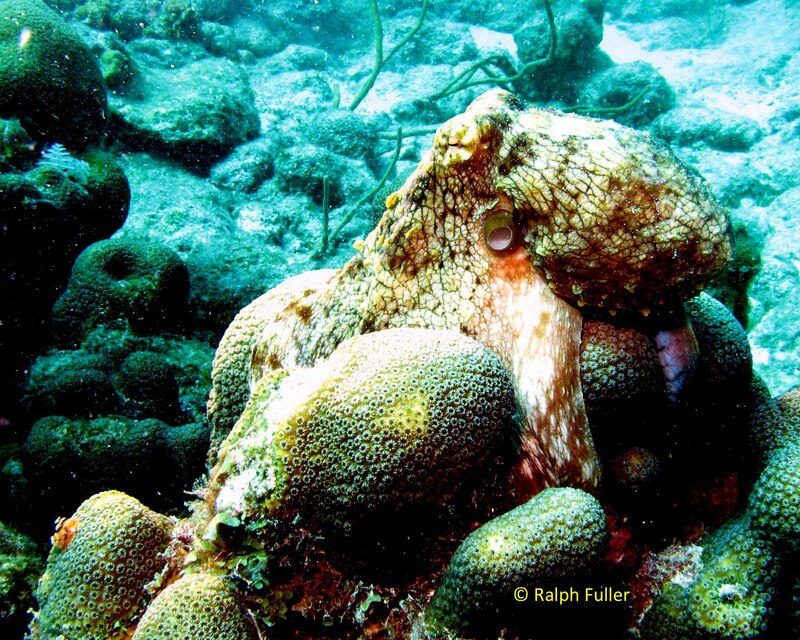 A Common Octopus (Octopus vulgaris) photographed at Salt Pier in Bonaire. CEPHALOPODS – OCTOPUSES, SQUIDS AND CUTTLEFISHES – are renowned for their ability to change colors and mimic surroundings like corals and other structures. In 2010, scientists at the Marine Biological Laboratory in Woods Hole, Mass., began researching the role of molecules called opsins, found in both cephalopod eyes and skin, with the idea that perhaps the animals skins helped them see. CUTTLEFISHES NO, OCTOPUSES YES Although their research with cuttlefishes and squids failed to prove that, it intrigued a team of researchers at the University of California, Santa Barbara, to study octopuses, in whom the opsin arrangement is a little different. Exposing octopus skin that was pale in darkness to sudden light, they found it turned dark very quickly. Experimenting with colors, they found the fastest response to be to blue light. THE LINK The two teams’ studies, published in the Journal of Experimental Biology, are discussed HERE by New York Times science writer Carl Zimmer.